During your stay at the Pompano Beach Club in Bermuda you will enjoy access to an exhilarating range of resort facilities. Guests have the option of playing tennis on either the resort's oceanview clay court or on one of Port Royal Golf Course's four all-weather courts (which are located only 400 yards from the resort). Court time during the day is complimentary on all five courts, and racquets and balls can be borrowed from the resort if you opt to leave yours at home. You can also purchase cans of new tennis balls at the resort's front desk. Court time can and should be reserved in advance - contact the front desk to reserve court space. A few of Port Royal's courts are lit for night play; however, a fee is assessed if you choose to play under the lights. Pompano does not have a "resident" tennis pro on staff; however, the front desk is often able to secure the services of nearby tennis pros if you are interested in hitting with a pro or taking a tennis lesson. Even though the resort does not have any specific tennis attire requirements, proper tennis sneakers should always be worn on a clay surface. The resort's oceanfront, air-conditioned fitness center (open from 6:30 a.m. – midnight daily) offers the most breathtaking ocean views of any fitness facility in Bermuda! Floor-to-ceiling sliding glass doors stretch the full width of the fitness center, showcasing unobstructed views of the resort's picturesque waterfront. The other long wall has floor-to-ceiling mirrors (ensuring that you'll be treated to ocean views no matter where you stand). ​The fitness center has spacious men’s and ladies restrooms, complete with showers and changing facilities - which are ideal for those departing on late afternoon flights. For those who want more than a panoramic ocean view to look at, a 33” wall mounted television with cable channels, is available. During the summer months, a "Slow Flow" yoga class (suitable for all levels) is offered on Wednesday mornings, on one of the resort's sand decks, overlooking the beach. The charge is only $25 per person for a 50 minute class. A sign up sheet is available at the resort's front desk. Pompano Beach Club's Three Graces Day Spa is located on the first floor of the resort's main clubhouse building, beneath the "Ocean Grill" restaurant. The spa offers a wide variety of massage and body treatments, manicures, pedicures, facials, waxing, couples treatments and special spa packages (click here to see the treatments available and a detailed price list), allowing you to indulge your senses and rejuvenate your mind and body. 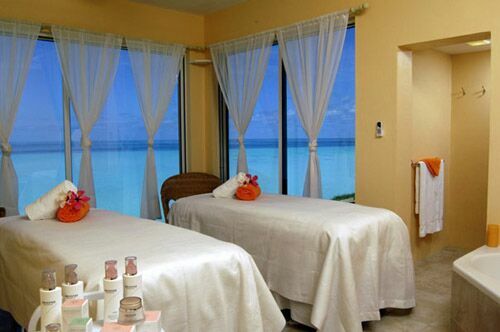 The spa is dramatically situated overlooking the resort's picturesque waterfront and now features three separate treatment rooms (with two of them located directly oceanfront - one designed to specifically pamper couples since it is equipped with both a shower and deep water jet bathtub to rinse off in after some of the treatments). ​From January through March, the spa is open from 9:00 a.m. to 6:00 p.m. Friday thru Sunday and from April through December it is open from 9:00 a.m. to 6:00 p.m., Wednesday thru Monday. Special hours available by private booking for groups. Advance reservations are recommended and can be made via an email to: serenity@threegracesdayspa.com or by telephoning the Spa at 441-234-0333. Before you begin your treatments, it is recommended that you arrive at least five minutes in advance to fill out a health history form. All appointments will end on time regardless of how late they start, so the next guests are not delayed. All spa services are for persons over the age of 16 years, unless special exceptions are made. The consumption of alcohol is not permitted before or directly after a treatment. The spa reserves the right to refuse to administer a treatment if alcohol use is suspected. Please rinse off sand, seawater or chlorine before a treatment to ensure quality service and effectiveness. Please wear footwear when entering the spa to also ensure quality service. Massages are not recommended for pregnant women in their first trimester. For your personal comfort, undergarments should be worn during all treatments. All therapists are highly trained/skilled in the correct draping procedure to ensure your complete privacy. It is recommended that you bring swimwear when having wet or mud treatments. The resort's oceanfront game room is conveniently located adjacent to the pool and beach areas, next to the two cliffside Jacuzzis and Three Graces Day Spa. The game room is open daily from 6:30 a.m. to midnight, attracting families and couples of all ages. It is equipped with an air hockey table, foosball (table soccer) table, ping pong table, pool table and two arcade video game systems. There is no charge to play any of the games. Floor-to-ceiling windows along two of the four walls enable you to view the ocean from anyplace you stand. You won't find a more scenic game room anywhere else in Bermuda!